In February 2002, I had an opportunity to attend the opening reception of the New York Print Fair, because the Verne Collection from Cleveland, Ohio started to handle my works. There is a worldwide print dealers association called IFPDA, and the Verne Collection is one of the members. The venue was hosted at the Armory on Park Avenue, it was once a building and weapons warehouse, and this is where its name comes from in the past. I was surprised when I checked in at the entrance and entered the venue, more than 100 gallery booths from all over the world were lined up in the huge space, selling prints through all ages and countries, and there were so many people in each booth and in the aisles as well. I looked for the Verne Collection booth, and met Michael Verne and Mitzie Verne for the first time. I was glad to hear that my works were also exhibited with their group, and that this brings a good reputation to me within the group. I was hoping to exhibit my work someday at the print fair in Boston MA, and had tried back in 1979, and even though it was not Boston, I finally got to realize my long awaited dream in the city of New York, and it filled my heart with joy and fullness.The customers are looking forward to the fair held once every year and looking for the prints of their choice, I was keenly aware of the size of American print market. In Japan, the works sell only when the exhibitions are held, unlike in the US, the works are diffused and sold at manual print fairs in big cities across the country. For the artist, the same work can be shown to many people more than once, so there is a merit of being able to produce work and I was spending plenty time doing it. I am very lucky to have handled my works in the US, because engraving method requires an enormous amount time. The fact that this fair has been continuing for a long time means that there are lots of collectors purchasing art works, and it can be said that the thickness of the support layer of American print market, provides much needed support to artist from all over the world, including myself. An art dealer named Robert Newman, who saw my work at the fair, had offered to handle my works at his shop. I took my works with me and visited The Old Print Shop at Lexington Avenue at a later date. It is the oldest print shop in New York, founded in 1898, when I went into the stop a lot of staff were working in a typical old shop interior that appears in the old movies. The shop has been stocking many kinds of prints, photographs, old maps and art books from all time periods, and a lot of items of New York. 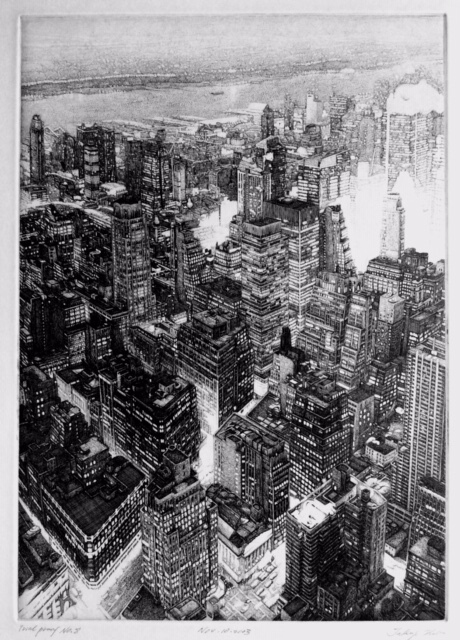 I was pleased to be one of the artists at the shop, and thought I would like to create more New York landscape works. I also wandered around the cities of Manhattan and shot photographs of various districts while staying. When you walk towards downtown on Broadway, there is a very pointed triangle land when you cross to Fifth Avenue and a triangle skyscraper is built to fit it. The Flatiron Building was built for the first time in the steel frame construction method in 1902, and was the highest in New York until The Empire State Building built in 1931, with an old fashioned Italian Renaissance style appearance. I loved the appearance of this old building, because the figure is something I had seen often in photo books, and I wanted to draw it someday. There is vast space at the intersection of the front of the building, it is easy to shoot photographs of whole building, but if you approach a little, you cannot stand inside of the intersection and cannot shot the whole building even with a 35 mm wide-angle lens. Since there was no choice, I shoot it by dividing the top and button into two. Technically speaking, when you are drawing based on photograph, the lens distortion must be corrected along the perspectives. Until the 1990s, while manually tracing to photograph to drawing, I corrected the distortion little by little by hand, in recent years we can do it very quickly with the lens correction of Photoshop, I just say thanks to the clever digital tool. Whatever city I visit, I do not go to the famous places and historical sites much, but I definitely climb the Empire State Building every time I visited New York. This is real country hick in a Japanese joke. I like to watch the scenery until the evening climbs, climbing before dusk, although the time differs according to the season. From the observation deck you can see the full angel skyline without glass, but it depends on the person’s luck whether you can shoot the shots you like. Even if the weather is nice, wind blowing at 320 meters per second above ground is more powerful than your imagination and makes it difficult to shoot a picture; sometimes you may not understand that until you climb it, and see if it can or cannot be done. I tried coverage to create a New York landscape of a bird’s-eye view like “Notre-Dame, The Spire.” The bird’s-eye view captures the landscape you see on the ground with a wide-angle view from the top, making it unusual to see if it is attractive. I took shots of various directions, but I liked the photo of Midtown, Hudson River, New Jersey, and tried to create an engraving of that view. Midtown in front, the buildings started to be built around 1930s and even today, it is the still the same sight and figure image. Ultra-made high view buildings started to be built in the Clinton District with Times Square at the head, when you are looking at these views, you can really see that in time, it is proven that Manhattan is a living city where it grows and changes over time. I have not climbed the Empire in more than ten years, but now it is a bit scary to climb because higher buildings are growing up like bamboo shoots all around it. 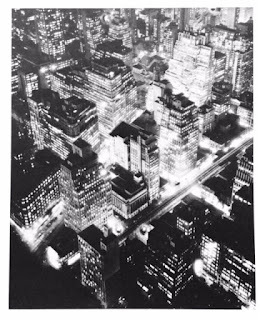 When I was looking in photo book of New York, I found a female photographer, with a text called “Changing New York,” by Bernice Abbott at the Strand Book Shop near Union Square. I brought it in spite of it being a thick and large sized book, and became a big fan of Bernice. After that, I think it was in a bookshop in Florence, that Abbott’s photo album was in the front of the book shop, and through it was unusual, I found a photo of the same place as my engraving on the page, I jumped up and purchased it pleasantly. When comparing the two works, you can see that the building in the county of Midtown which have withstood the weather for more than 80 years of hardship, still keep it appearance almost unchanged, while some of the newer building do not well hold up to the test of time. We usually walk on the ground and see various building, but we cannot see the whole building. However, when looking from the sky like a bird, we can feel the full character and features of each building even the personality of the designed architect. Watching the skyscraper rising into the sky from above will also make you more familiar with New York. At the bottom of Abbott’s photograph taken in 1932, a viaduct appears on the obliquely extending area on Broadway, but at that time it seems that the subway trains were running. I would like to time warp back to 1930s New York, and I would like to clime the observatory of the Empire, and would like to meet Bernice. Shall I wear Nikki Polka...? In April 2004, I flew to New York and visited Sag Harbor where Dan Welden lives. The studio and house are in a vast forest, Dan seems to be a kid, and with his wonderful nature has built three log houses over a five year period, it is all so wonderful, and buildings with their handmade feeling adds joy to the air and your heart. There was a studio on a semi-ground room where I studied the new intaglio printmaking method using a polymer plate from Dan Welden. A feature of this method, called solar plate, is safe to corrode the plate with water and faster than conventional etching to corrode with acid. The non-toxic printmaking movement occurred in the US in the 1970’s, and attempts were made to produce prints without using acid and chemical solvents. The solar plate matched this exercise, so printmakers began to use it as a plate material. Dan Welden developed this process around the end of 1970’s, and he left us all with this big achievement. I like this safer method, and I wanted to practice secure printmaking in Japan, using this method. When I returned to Japan, I searched for a Japanese polymer plate and continued my research for two years, and created photopolymer gravure works which convert monochrome photographic images into a print. I presented my first solo exhibitions in Tokyo, Shanghai and Yokohama from 2007 to 2009. I introduced the solarplate method to Japanese printmakers and young students, and taught several workshops at the universities and it gradually began spreading in Japan. Sag Harbor is a rural town with a small harbor and the surrounding seas are beautiful, with scenic sightseeing spots. Dan introduced me to his friends, art critic Helen Harrison and her husband, painter Roy Nicholson, and I became friends with them all. Roy was born in Cambridge, UK, and lived in London when he was young, he knew Birgit Skiold well. I felt overjoyed and a deep in knowledge that it was Roy who introduced Dan to Birgit in 1978. Helen is also a researcher of the American modern painter Jackson Pollock, one of the most respected American artists I was privileged to represent in some of my works. Helen presented me her book “Such Desperate Joy,” and I learned a lot from her writings. Helen is the most intelligent American lady I have had the privilege to know. She always talked to me with words that reminded me of the poetic way she wrote. She told me that the house and studio where Pollock lived is still there and I went to East Hampton with my friends by car the following day to see it. It is a two-story house that stands right near the quiet ocean cove, and there was a small wooden warehouse where Pollock began Drip Painting behind the lawn garden. I felt that I was in an important place in art history and was so excited. Pollock married Lee Krasner and they moved to East Hampton in 1945, after which many successful artists in Manhattan learn from Pollock and Lee, and they started building a studio in the Hampton area. There are about 3000 artists living there now, so if you trot about, you will find an artist in Hampton. It is a pleasant memory that I was able to show my works, “On Paper,” at an exhibition held at Ashwash Hall just beside Pollock’s house. and interacted closely with the local artist. I came back from Sag Harbor to Manhattan, and there I met an American modern artist named Masaaki Sato who was born in Japan, it was the first time at the exhibition venue. Sato is a big senior artist who moved from London to New York in 1970 and is producing paintings, sculptures, printmaking etc. I was invited to his studio in West Bess at a later date, and he showed me his silkscreen prints, and it was splendid work with a sense of tension with vivid color being printed and with a solid feeling. Also, the characters of the newspapers and magazines of the News-stand series were changed by Sato’s idea, and it was a deep message that was sent to the viewers. 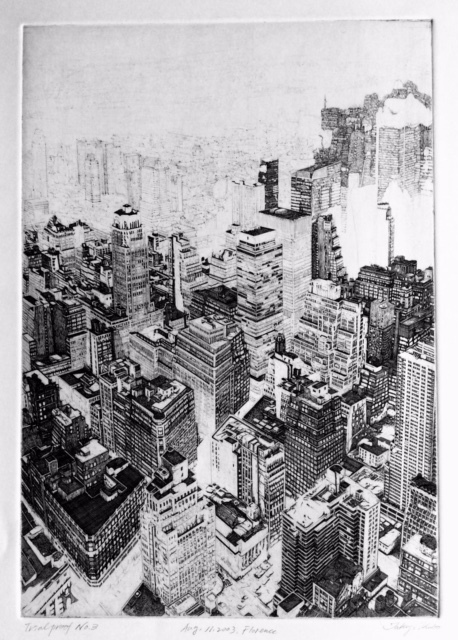 In 2007, Sato 's solo exhibition was held at the Ikeda 20th Century Museum in Ito, Shizuoka, and I continued to meet him each time I visited New York, and we became close friends. Sato informed me of two solo exhibitions in Taiwan in 2008, and I gladly accepted his invitation to go, and headed for Taipei. An old friend of Sato, a Taiwanese printmaker who worked in New York, Professor Shiou-ping LIAO co-ordinated and held the two solo exhibitions at the Howard Salon in Taipei, and they were received with good reviews. Even then, Sato is engaged in creative activities while challenging numerous art fields such as his Big Apple sculpture and showing his overall works. He dared to stand in the harshest environment of art criticism in New York, and I would like to express respect to artists who stick to that attitude. In 2004 I received e-mail from Mr. Fitch and reported that he sold some of the pieces of my work to the Rembrandt House in Amsterdam, Holland. It was an honor to have my works stored in the collection of the house. I respected the great painter and etcher, Rembrandt, and often wished I could have been in the world he lived in to for a time. After that, in April 2005, I called Mr. Fitch again, but he was getting old and he will be close his gallery and told me to make business at his house in Croton-On-Hudson, I left the gallery with loneliness. Cindy, who had been an assistant for many years, moved to Connecticut and she purchased “Flying Lizard”. Since I met Mr. Fitch for the first time in 1979, he ha s shown me the direction in New York of a young artist, and has given me a warm hand to its potential. Thank you very much for your support Andy!